Everyone has stress and people have varying methods of how they relieve their stress. Some get massages, others take a sip of wine/beer, but all find their own way to relax. Lately, my form of relaxation has been to play with BJ. I could be having the MOST stressful day at work, but when I come home and see the smiling/playful baby, who's not much of a baby anymore but more of a toddler, I can't help but smile and feel happy. This is BJ playing with his new toy. The balls wind down the spiral plastic piece and gets shot out of the hole at the top. 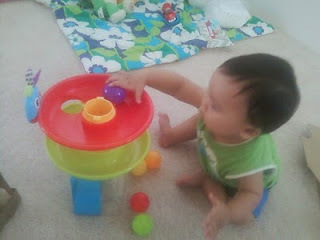 In the short span that I was gone from the blogging world, BJ has learned to play with his own toys! He loves musical toys and balls, so this toy is perfect because it has both! :-) (No, I am not conducting a review of this product. BJ just really loves it. lol) I told myself I wouldn't purchase random toys for my future babies b/c I want to save money... but I ran across this toy at a big-box store and just HAD to get it. Oh my; I sound like a spoiling mommy don't I? I just couldn't help it. When BJ gets older, I'm going to have to work on not spoiling him and being more strict. For now... toys, toys, toys galore. hehe. Sounds like your boy is growing, so precious. Oh so cute! I miss those baby baby days! Thank you for such a wonderful post. I enjoyed every bit of it. Annnd I'm back! Seriously this time. New HOUSE!! !